Local architecture office Neogenesis+Studi0261 designed the house for an agriculturalist and his family, who wanted be able to look out at lots of greenery despite their home's urban setting. The Jungalow House is located in the city on the coast of the Indian state of Gujarat, where the climate is typically dry throughout the year until the monsoon rains arrive around mid June. The main theme starts at the exterior. Every balcony is draped in vegetation like an urban jungle. At the heart of the home is a double-height courtyard. Encased in glass, the lush landscape is showcased in the main living area while flooding the ground floor with natural light. The garden is filled with vines and creepers that make their way to the second story. 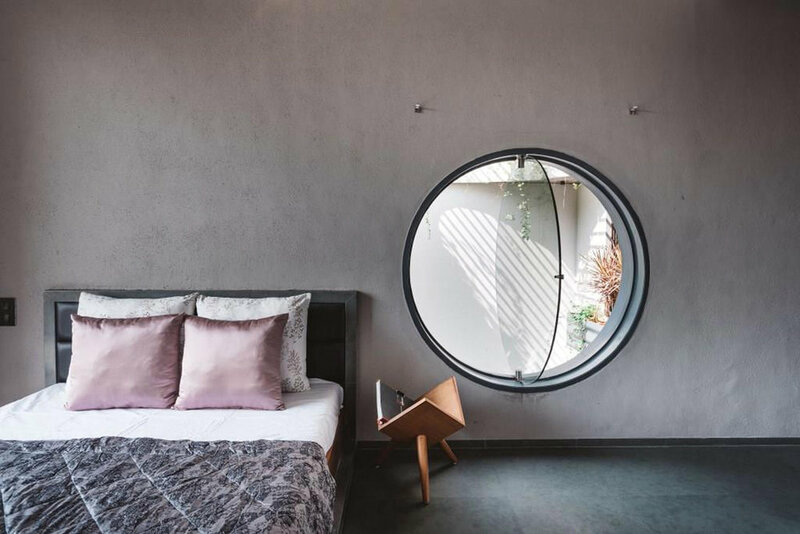 Circular windows frame in the greener for the master and surrounding bedrooms.